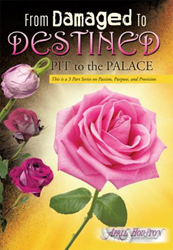 April Houston’s new book From Damaged to Destined: Pit to the Palace ($15.99, paperback, 9781545610237; $7.99, eBook, 9781545610244) was written to get individuals to discover and uncover who they are and who they are meant to be. It will open the eyes and stir the soul as they are compelled toward their destiny through the author’s personal journey. The readers will discover their purpose and gift, gain the secrets to surviving in every season of their life, and gain knowledge on how to master the obstacles of the mind and move forward. This is needed to overcome fear, doubt, remaining stuck, anger, frustrations, confusion of the mind, and so much more. This book is inspiring, captivating, intriguing, compelling, and soul stirring. April Houston is an author, Master Life Coach, and motivational speaker and has dual degrees in Psychology and Biology. She has impacted thousands of women and with her 100% success rate she has been voted the #1 Life Coach in East Texas for the past seven consecutive years. Her expert advice has been featured on various radio shows and in articles in multiple top magazines from which she has expanded her client base from Texas to Los Angeles to New York to London. April was born in Dallas Texas, and moved to Houston Texas when she married her wonderful husband, Aaron Houston, and has been married for nineteen years. He is the founder and Pastor of Kingdom Harvest Ministries. They have four adorable children; Kristian Alexias, Kalyse Alexandria, Kyla Alexandra, and Aaron II(Deuce). Xulon Press, a division of Salem Media Group, is the world’s largest Christian self-publisher, with more than 12,000 titles published to date. Retailers may order From Damaged to Destined: Pit to the Palace through Ingram Book Company and/or Spring Arbor Book Distributors. The book is available online through xulonpress.com/bookstore, amazon.com, and barnesandnoble.com.